In the logistics business it takes A LOT to get a product, a package, a technician from point A to point B. It requires the coordination and management of people, equipment, software and most importantly, the customer’s expectation. Look at FedEx, 90% of their revenues go towards their operating expenses. They expense $25 billion dollars a year in salaries for 290,000 employees, for planes and trucks, maintenance and supplies, etc. They have more than $18 billion dollars in equipment deployed to generate a measly $1.5 billion in income for their shareholders. Despite the $18b in equipment deployed and the $25b in operating expenses, for me, it all comes down to “Sam”. “Sam” (real name unknown) was the delivery associate responsible for getting a package from a local FedEx distribution center to my home a couple weeks ago. I needed to get an inexpensive laptop as a backup and I needed to get it to my home within 24 hours. I jumped online and found the perfect solution, a refurbished HP unit from walmart.com and for an additional $20, it will be at my home within 24 hours. Bingo! Yahtzee! Bullseye! I’m all in and ordered the unit, tack on an additional two years of warranty for $48 and for under $500, I’m all set. I carved out a couple hours in my schedule the following day to do my data backup and get rolling. I get a quick post purchase email from WalMart and thats where my relationship with “Sam” is born. My email from WalMart has everything I need, an invoice with all the product and price info along with instructions on how to track my new purchase through the delivery process. How cool is that?! I can watch MY package move along this huge supply chain right to my front door and I know that I’ll be typing away on my new laptop by this time tomorrow. Cool. So it starts, the $88 billion operating organization of 2.2 million people at WalMart do their thing and they have my package ready for FedEx pickup within a couple hours. FedEx picks up the package in California (presumably at HP’s facility) and get it on its way. It moves 1,700 miles in about 12 hours and it’s ready to be dispatched to my home. Driver “Sam” picks up the package at 6:30am and its “out for delivery”. Cool. While all of this is going on, I’m preparing to get my backup process started, specifically copying, deleting, moving, defragging, etc etc etc. From time to time, I click over to FedEx’s site to check on status and I’m thinking how cool the technology is that I can virtually watch my package move across the country to my front door and so I’m closely monitoring the FedEx tracking website. At 1pm nothing yet. 3pm nothing yet, 4pm nothing..still “out for delivery”. Then BOOM! 4:37pm…”Package delivered, left by front door”. Awesome, its here! Wait…why didn’t the delivery driver ring the bell? That’s strange, I was sitting 25 feet away and certainly would have heard it. Hmmmm. I go to the front door, look around the porch, nothing there. Hmmmm. I live on a corner, maybe “Sam” left it by the back door. Look there…nothing. Its now become obvious what has happened. “Sam” has either jumped ship or has delivered my package to the wrong house. Time to call FedEx. The FedEx customer service folks are VERY busy late in the day. Imagine call volume from all their disappointed customers expecting a package that wasn’t delivered. Those calls don’t come in at 9am, they come in at 5pm, exactly when I started calling. The agent was very helpful, or at least tried to be. She had just about the same visibility that I did but she could also see that “Sam” was driver responsible and she was able to start contacting “Sam”. Unfortunately, “Sam” was done for the day and had turned all of his company issued electronics off. The agent had to break the news to me, I was not going to get my package that day. Why can’t Google street view be used to verify and visually confirm address for drivers? If they are completely committed to delivery on time, why does the process stop when the driver decides it’s time to stop? There are obviously many other questions, many other opportunities for improvement, but the overarching question stands…..what are companies doing to ensure that the last mile is the most important mile to delivering outstanding service and meet their customer’s expectations? FedEx isn’t the only company facing these issues. Think about the Cable and Satellite TV business. They are dispatching thousands of independent contractors every day to people’s homes and businesses. These contractors are the face of the company…they are “the last mile” for Charter, Time Warner, DISH, etc…What are these companies doing to ensure last mile success? I worked with a transportation service broker and the call center staff dealt with thousands of phone calls from customers and it was always “last mile” related stuff that created the highest levels of dissatisfaction and the greatest complexity in our business. Constantly evaluate your complete value and supply chain to make sure you are investing in areas that will deliver success at the “last mile”. In the FedEx case, there were a number of simple things that could have been deployed to ensure success that most likely get overlooked in favor of big ticket items like: the rising cost of jet fuel, healthcare costs, EPS, etc. 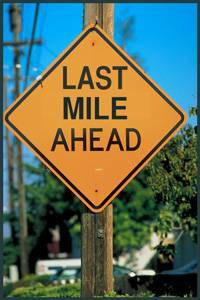 Make sure that every staff member understands the critical success factors of that “last mile” and is compensated and incentivized to deliver to them. Remember that the computer programmer, executive assistant, marketing director, and ultimately the shareholders lose if “Sam” doesn’t deliver the “last mile”. If your customers are completely satisfied and you own the last mile in your industry, you’re in the driver’s seat and you can significantly raise the barriers to entry for your competition. So, back to my package. After crying myself to sleep, I received a call the next morning from a neighbor a couple streets over who said she had received a package addressed to me and she put it in her home too late in the evening to call me. In end, it took a little old lady with a paper phone book on a landline telephone to call a tired biz dev exec to deliver “the last mile” for a $45 billion company. I’m fairly confident THAT process map isn’t on any whiteboard in Memphis.